Intel is preparing to make changes to how manufacturing will be managed after the arm's leader retires in November, with claims the group will be spit into three segments with separate leaders, as the company attempts to catch up with its repeatedly delayed product launches. The current head of Intel's Technology and Manufacturing Group Sohail Ahmed will be leaving the company to retire next month, the chip producer advised to employees on Monday. Ahmed will be departing after being the chief of the group since 2016. Rather than continue as one group, it will instead be split into three, according to The Oregonian, with separate segments for technology, manufacturing and operations, and the supply chain. Head of Intel Labs Mike Mayberry will lead technology development, with Rich Uhlig running Intel Labs on an interim basis. Manufacturing and operations will be led by Ann Kelleher, who had previously helped run the original group alongside Ahmed, while the supply chain will be controlled by Randhir Thakur. The three heads of each section will be under the management of Venkata "Murthy" Renduchintala. Previously at Qualcomm until 2015 when he moved to Intel, he is currently the chief engineering officer and also the president of a number of Intel's businesses. The management shakeup occurs while Intel is slowly making the transition to a 10-nanometer process from a 14-nanometer version, one that has been frequently delayed and has only started to reach consumers and industry customers, albeit with relatively few options. The 10-nanometer chips were originally expected to arrive in 2016, but were repeatedly put off over yield issues. An open letter from the interim CEO Bob Swan issued in September insists that mass production of 10-nanometer processors is still on the cards, for sometime in 2019. In the meantime, it will be increasing its investment of 14-nanometer manufacturing, in order to capitalize on an increased need for high performance processors. 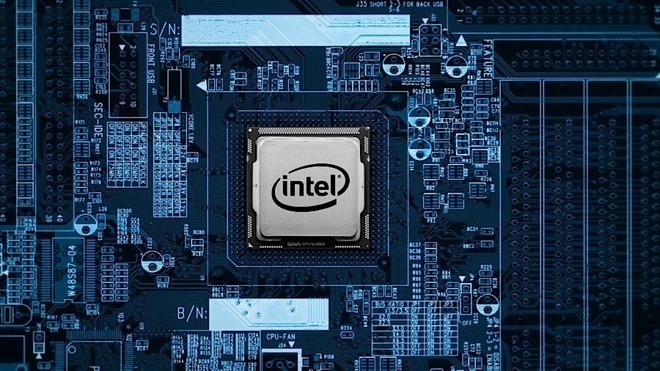 One September report claimed chip production rival TSMC was contracted by Intel to produce some of its 14-nanometer chips, including the H310 and other 300-series chipsets. It was alleged Intel was short of meeting demand for 14-nanometer chips by "as much as 50 percent," with outsourcing being one of a number of possible solutions to the problem. Switching to smaller manufacturing processes are usually problematic and costly maneuvers for chip firms. While Intel is struggling to get to 10-nanometer, TSMC is already using its 7-nanometer process to manufacture Apple's A12 Bionic chip. Under the name "Cannon Lake," 10-nanometer processors offer a variety of performance and cooling benefits, but for Apple, it represents a potential memory expansion. July's 15-inch MacBook Pro refresh did introduce a 32GB RAM option, but only through Apple modifying the design from using the limited LPDDR3 memory to more power-dependent DDR4 memory. Cannon Lake-generation processors will include LPDDR4 support by default, and could offer power savings over the current high-RAM solution. So far, Intel has released only one processor in the Cannon Lake range, the Core i3-812U. The dual-core chip has a base clock speed of 2.2GHz, rising to 3.2GHz when boosted, and offers a notebook-friendly 15-Watt thermal design point.